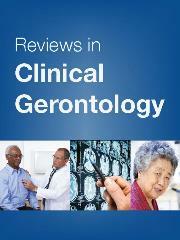 Reviews in Clinical Gerontology brings together specially commissioned international reviews on recent developments in geriatric medicine (including rehabilitation, nursing care and psychiatry of old age) and in biological, psychological and social gerontology. There is systematic coverage of the literature on a cyclical basis. All the major topics of interest are reviewed during the course of a five-year cycle. The issues build into a valuable source of reference for everyone working with elderly people. What is a clinical review?